You’d think that excelling yourselves every season may get a little waring after ten long years but the guys behind Bearded once again absolutely nailed it in 2017. This reviewer has long regarded Bearded as the festival to beat in the small-medium sector of the market, and this year was no exception. Remarkably, they successfully manage the precarious balance between quality, quantity, and value in a manner that must leave some other festival organisers shaking their heads in disbelief. A bargain £105 buys you around 150 class acts over four nights (Madness / Skunk Anansie / Seasick Steve et al), five main stages, decent facilities, some very very special activities for the kids, plus a vibe from a crowd that is simply priceless. The old cliché about people making events has never been truer than at Bearded. There is a buzz and intensity that sometimes makes your hair bristle, whilst also managing to deliver an extremely laid back and, well, mellow weekend. The audience is a right ol’ melting pot of all ages and preferences as diverse as the line-up, and in these troubled times, the camaraderie and sense of a shared community was all rather refreshing and life affirming. This was a great friendly crowd who certainly knew how to party! The weather was mostly absolutely blistering and the bars were heaving. Remember too that Bearded should be rightly lauded for remaining one of the few events of this scale to allow punters to take their own alcohol into the arena if that’s your preference. A big-up for the techies too; the sound and visuals from the main Pallet stage and the atmospheric Woodland stage were pretty much on the button, as was the AV extravaganza in the hippy trippy beaty madness than was Magical Sounds. The more intimate Maui Waui and Convoy Caberet tents and the 24hr Something Else Tea Tent maintained a thumping atmosphere all weekend. There was very little to fault all round. (More disabled toilets and educating some of the able bodied as to why they are required should be on next year’s to-do list, mind). Thursday night was all rather special. Normally it’s more a set-up day with lower key entertainment, but to celebrate their 10th anniversary, Bearded provided an opening night line-up of many of the bands who graced their very first Bearded. There are some bands who are simply festival staples; booked because they never give poor value and are guaranteed to get any crowd off their butts and dancing. 3 Daft Monkeys and Dreadzone performed the role with aplomb. The place was kicking for both acts. The Dafts played on various stages throughout the weekend and were on top form. 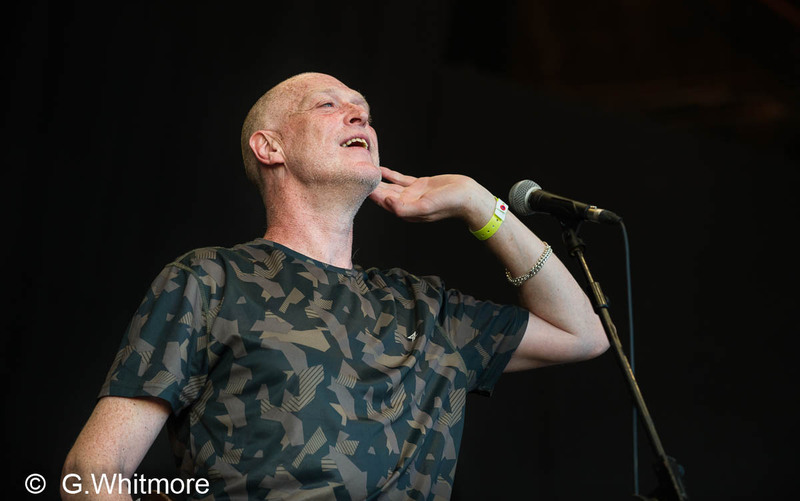 Dreadzone’s dub reggae vibe is ALWAYS a crowd pleaser and ‘Little Britain’ in particular brought the house down. A great start to festivities. Friday witnessed Jaya The Cat’s promotion to the main stage after they wowed this reviewer, alongside several hundred others, on the second stage a couple of years back. Dem Boyz Dun Well. A splendid set of edgy reggae beats. Friday’s temperature was near 30 degrees in the arena, and like many, we chose to sit and chill main stage but made the effort to catch the excellent Roving Crows over on the Woodland. Hard to define with a country blues backdrop overlaid with Celtic folk rhythms and much else, they really are a terrific band. A great set with new song ‘Bury Me Naked’ probably the pick of a very fine bunch. Ferocious Dog quickly had us on our feet and bouncing. Another great festie band who always bring their own army to festivals. Probably more FD merchandise on punters backs than any other band over the weekend, and it showed when the band sparked up ‘Hellhounds’! Whirling swirling madness and great stuff. The Alarm were on the ball and charismatic frontman Peters had the enthusiastic crowd eating from his hand during some excellent singalongs. Nothing prepared us for Skunk Anansie ! Apart from a couple of old CD’s I used as coasters years ago – the band really passed this reviewer by. Well – they are back – and with a vengeance. As a previously unknown quantity FFA would have to award them our set of the festival. An absolutely stunning 90 minutes of awesome power rock with subtle rhythmic undertones that took the breath away. Faultless, slick, and as tight as a nut. In the machismo world of rock, singer Skin was an absolute delight. She owned the stage and the arena. Her excursion into the crowd will be talked about for years to come. Fabulous…and it was only Friday! Saturday we caught the Bearded bug for top notch mid-afternoon reggae beats over on the main stage and rocked up to catch the splendid African Head Charge. More heavily dub driven than I recall, and all the better for it. Great set. Cor Blimey O’Reilly the masters of sleaze and country acid house rolled into town! Alabama 3 - suitably chaotic and ramshackle as ever but what a show these guys deliver. A couple of personnel changes didn’t dent their style and the constant reinvention of old classics like ‘Hypo Full Of Love’ and ‘Woke Up This Morning’ keep this crew as entertaining as ever. Splendid. The marvellous Tarantism, featuring a replacement guitarist, absolutely shone in the Convoy Caberet. Their ‘We Drank the Levellers Rider’ little ditty had the tent bouncing. Excellent. Rather like Ferocious Dog, the good folk over at team New Model Army always bring along their own posse, and are yet another old stager festie band who just know how to deliver a great set … and, er, they did. Headliner Seasick Steve brought his unique brand of hillbilly blues to Derbyshire and produced a fine set of thoughtful finger picking and driving, foot stomping boogie. Foy Vance excelled with moody Celtic fuelled blues over at the Woodland and there is an intensity and deepness of spirit surrounding the man that makes his soundscapes somewhat addictive. FFA’s only negative is one of scheduling rather than artistry with the headliners. A different genre of music on the second stage to go head-to-head with Seasick Steve, rather than Vance’s moody off the wall blues, may have been more appropriate for a Saturday night. A big up for the crew running the The Ship throughout the weekend. A ragbag of DJ’s graced the, erm, decks, to provide a great pit stop between the main stages. Everyone appeared to dock for a few minutes to throw a few creaking shapes before wandering off into the distance. A great scene. Likewise for Magical Sounds, Maui Waui and Convoy Caberet with some great acts going down… FFA wafted in and out of them all like butterflies just feeding off the scene and breathing in that Bearded vibe. Sunday was another hot day with more stage clashes than you could shake a stick at. John Robb and team Goldblade proved once again the timeless spirit and quality of the punk ethos, before Robb MC’ed the festival’s beard record attempt shenanigans… great fun, but not before a fitting and poignant tribute to the victims of the Manchester bomb outrage. 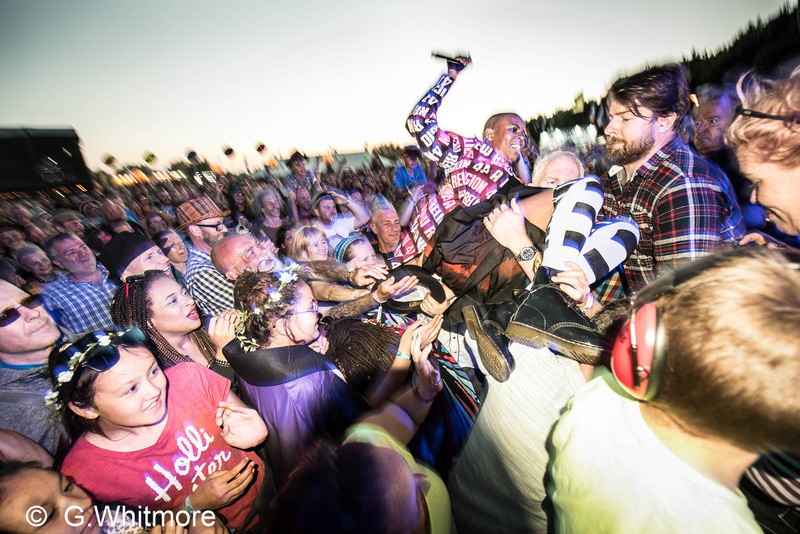 The Selecter got one of the best reactions of the weekend and ‘On My Radio’ had a very hot field absolutely bouncing. Katheryn Roberts & Sean Lakeman produced a beautiful set of thoughtful laid back songscapes as well as an amusing Toblerone / Travelodge story (don’t ask!). Wonderful calming stuff on a sometimes hectic day. Pronghorn ramped it all up again with some blistering hi tempo folk in a great singalong set. Dub Trees over in Magical Sounds were absolutely excellent. Featuring the distinctive bass of Mr Jah Wobble, the band should really have played later in the evening where their trippy hypnotic beats would have had maximum impact. Go check these guys out – superb stuff. Madness closed the main stage and what a class act they are. Suggs ruled the roost but was supported by some fine musicianship. It was hit after hit and the crowd were going wild. For this reviewer at least, the performance stuttered mid set, but regained pace for the closing numbers and the whole place was kicking. The scenes in the arena as they let rip with ‘One Step Beyond’ as the famous, and fabulous Bearded theory fireworks display lit up the sky will live in the memory for many a year. Two wonderful sets from a very trippy Transglobal Underground and Reverend & The Makers closed the whole shebang in great style. A superb day of music. As FFA said at the top of this article, Bearded is still up there in the top echelon for a festie of this size; a great crowd and a great weekend. We left knackered, sunburnt… and grinning from ear to ear. Roll on the next ten years. Proper photography courtesy of Graham Whitmore. Check out more of Graham’s work HERE.